Speaking of Twelve: I have a goal of losing twelve pounds in the first six months of 2012. That is only 2 pounds a month. It is a goal, not a resolution. What's the difference? We reach goals. Resolutions rarely stick. 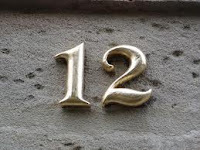 One more twelve reference: For twelve days I have been feeling out of sorts. I did not do my normal exercise - in fact I stopped exercising with the exception of two days out of twelve. Those two days I told someone else in bloggerland that I was exercising and I did. However, I did not do more than that. Two days ago I started feeling better and got back into my exercise routine. I do not know why I slacked off on the exercise for almost two weeks but I am grateful it seems to have passed. Do you have any numbers repeating themselves in your life today? My number today is four - a four day cruise! And it's not about coming back stuffed. I'll share with the waiter right off the bat that I don't eat sugar or wheat, and I'll get my food to my liking. And the difference between flimsy New Year's resolutions and goals is simple. Goals are dreams with an action plan! I am working with so many people who had previously put dreams to bed, but now are achieving them! It's so fun to be on that path with people! No real numbers for me, but what resonated for me was your goal of 12 pounds in the first 6 months of 2012. My slow, but steady weight loss is about 2 pounds a month (18 months and 40 pounds off). SO, to me that is reasonable and sensible. I know you have lost a lot of weight, but those last pounds are the hardest. No real numbers for me. I just want to not gain during this month. 2 pounds a month is a very reasonable goal. It's actually nice to see a goal like that than the usual ones of 10 pounds a month! The number on my mind today is 23. 23 days until Christmas!!!! Yikes!!!! Just today I was thinking about the number seven, and the ways it pops up in spiritual contexts (seven deadly sins, seven gifts of the Holy Spirit, the seven mansions of St. Theresa's inner castle, and on...). Sadly, I'm a spiritually lazy person, so seven is not particularly significant to my life lately! I've just found your blog and am reading through all your background story, tips, etc. Thank you! I have words which do this and also numbers. It is like they are following me around waiting for me to take notice. I love that you are taking your 12's and rolling them into a pattern. It speaks to me. Vicki - I count myself as a Trekkie, too - Although I am limited to the original series (which I did not watch until the late 70's) and the first 5 movies.